Planning on hosting a big-time seafood boil anytime soon? 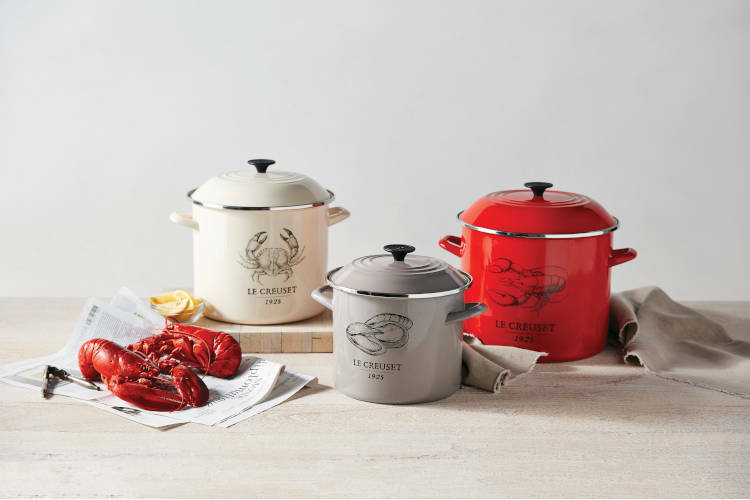 The Le Creuset Enamel on Steel Seafood Inspired Stockpots are perfect for steaming crab, lobster, or mussels for a simple dinner or family get together. The enamel on steel coating ensures rapid boiling, and the lids are designed to help lock in moisture and flavor. They come in 3 sizes - 8-quart pot, 12-quart pot, and 16-quart pot - to fit your various entertaining needs. When the weather cools down, you can also use these sturdy stock pots to make a batch of your favorite soup, chili, or stock. Each Le Creuset stockpot is beautifully designed with a different shellfish etched in vintage style on the exterior. Do not bang a stockpot down onto a stove's surface or work surface. Repeated banging may damage the exterior enamel. Use an oven mitt or silicone Cool Tool™ to avoid burns or injuries. Never place a stockpot in the dishwasher. To clean, simply hand-wash the stockpot with hot, soapy water. Rinse well, and dry thoroughly. Do not submerge stockpots in water – the water may become trapped inside the vessel and can lead to rusting.